(Strasbourg) “My name is Greta Thunberg and I come from Sweden. I accepted this invitation to come to the European Parliament to convey a message and speak on behalf of those young people who, like me, are worried about climate change and the ecological crisis”. 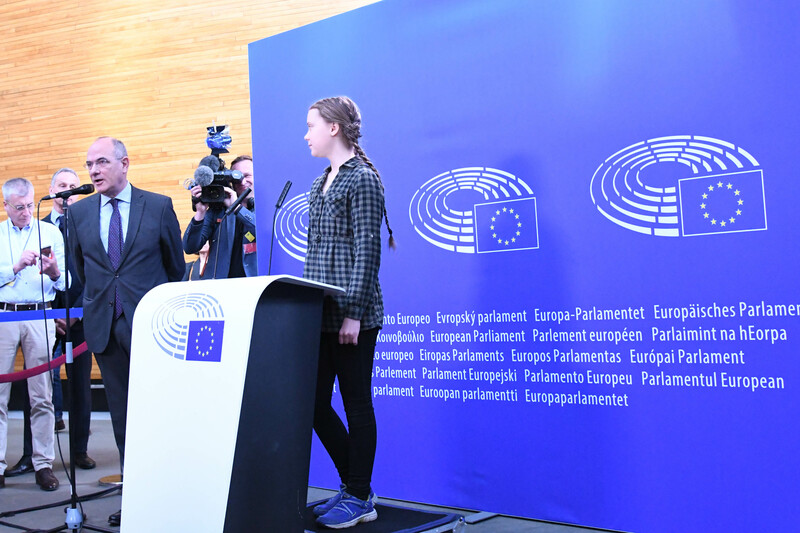 Climate activist Greta Thunberg said this today in Strasbourg as she timidly addressed a crowd of journalists from a small podium set up next to the European Parliament hemicycle. At 10 this morning, she met with the President, Antonio Tajani, and at 2pm, she will attend a meeting of the Environment Committee. She will repeat her message: “Politicians have to take action now, because there is not much time left. We still have an open window that is not going to be open for long, so they should take this opportunity to do something”. “You will meet the Pope tomorrow, what would you tell him?”, a journalist asked her. “I do not know yet, but maybe I will tell him something about the climate”, Greta replied with hesitation. Then she urged young Europeans fighting for the climate: “We must continue our struggle because we are doing a great job. Thousands of students in Europe went on strike for the climate and made history; they should be very proud of themselves”. And she encouraged them to go to the polls in May: “It is essential to vote in the European elections, although I will not be allowed to do it”, in order to “choose those who will have to address this crisis”.“Besides demonstrating, what can young people do in practice to change things?”, SIR news agency asked her. Greta replied: “There are many things young people can do to improve the situation: above all, they can put pressure on those in power and on adults, because they are the ones who can have the most impact. However, there are also things that you can do on an individual level to change your habits and try to become as carbon neutral as possible in your daily life”. And she concluded: “The most important thing you can do is to try to understand the implications of the situation, what is going on and why you have to fight to stop this happening”. Finally, a personal question: how much longer will you be able to continue this campaign at this pace? “I don’t mind what I’m doing. Personally, I’m happy to do something important, something for which I’m needed”.